Structured data is becoming an increasingly important part of the web ecosystem. Google makes use of structured data in a number of ways including rich snippets which allow websites to highlight specific types of content in search results. Websites participate by marking up their content using industry-standard formats and schemas. To provide webmasters with greater visibility into the structured data that Google knows about for their website, we’re introducing today a new feature in Webmaster Tools - the Structured Data Dashboard. 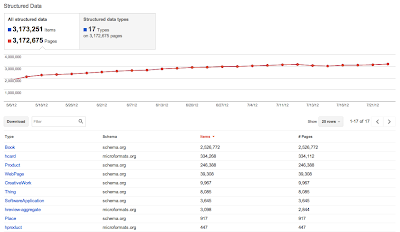 The Structured Data Dashboard has three views: site, item type and page-level. 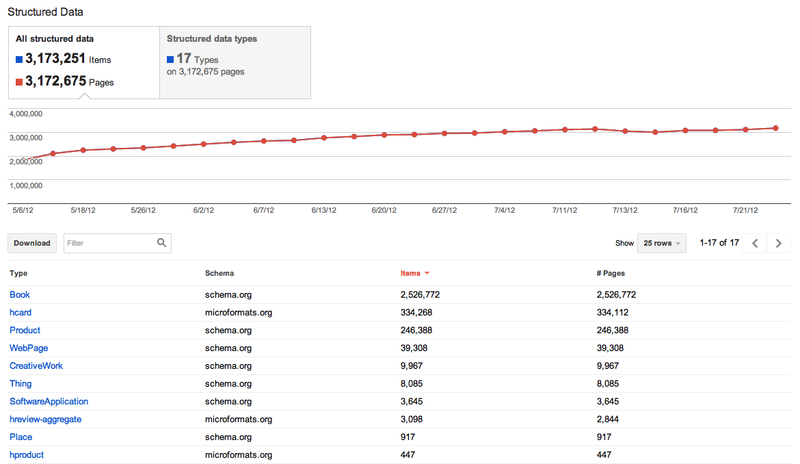 Google parses and stores a fixed number of pages for each site and item type. They are stored in decreasing order by the time in which they were crawled. We also keep all their structured data markup. For certain item types we also provide specialized preview columns as seen in this example below (e.g. “Name” is specific to schema.org Product). The default sort order is such that it would facilitate inspection of the most recently added Structured Data. Last but not least, we have a details page showing all attributes of every item type on the given page (as well as a link to the Rich Snippet testing tool for the page in question). Webmasters can use the Structured Data Dashboard to verify that Google is picking up new markup, as well as to detect problems with existing markup, for example monitor potential changes in instance counts during site redesigns.